You’re welcome to bring others with you, including parents and carers. As our campus is only a short walk from the city centre, you can visit Leeds too. Taking a stroll in the city gives you a real taste of what it has to offer, from shopping and entertainment to the many restaurants and bars. As your choice of university is very important and we want you to have all the information you need to help you make the right decision, we invite suitable applicants to attend an applicant day, which we encourage you to attend. chat to current students and academic staff. The day will give you the chance to discuss your application, check your course is right for you and your career plans, and have your questions answered. You’re welcome to bring others with you, including parents and carers. We offer tours most Wednesdays during term time, with more frequent tours available during peak times. Find out more. For any queries about campus tours please email campusvisits@leeds.ac.uk or phone 0113 343 6792. UCAS fairs are a great opportunity to have your questions answered and pick up a University prospectus. Our Education Engagement team attend many local and national HE fairs and conventions. These events provide Year 12 students with an excellent opportunity to find out more about the opportunities at the University of Leeds and have any questions they may have answered in person. University of Leeds staff and recruitment officers regularly travel overseas to meet with students interested in studying in the UK. These visits include attending exhibitions or conducting interviews at our overseas representatives’ offices. Our staff are able to give you advice on anything, from studying at the University of Leeds, choosing the right course for your future career and guidance on how to apply. Our alumni also often attend such events, so you can find out more from them about their experiences of studying with us. Academic staff and other representatives from the University of Leeds International Office regularly travel to countries such as China, India, Nigeria, Malaysia, among others, to meet with students interested in studying in the UK. Take a look at our upcoming visits to find out if we are attending an event near you. 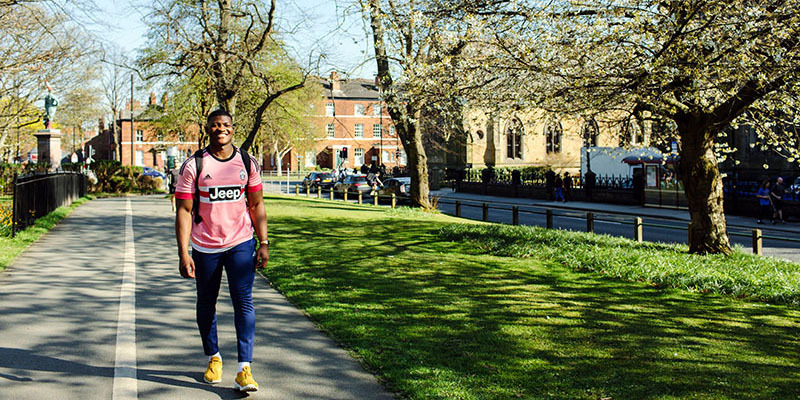 If you’re thinking of applying to or are an offer holder of the University of Leeds and would like to hear about other students’ experiences, you can speak with one of the Link to Leeds Ambassadors. They will be able to answer questions about life as a student at the University and what it is like to live in Leeds.